The Japanese ceramic tradition began more than ten thousand years ago during the Jomon period (10,500-300 BCE). Some of Japan's earliest potters produced bold, asymmetrical designs and forms like this one, which appears strikingly modern. The Japanese ceramic tradition began more than ten thousand years ago during the Neolithic Jōmon period (10,500–300 B.C.). During this time Japanese potters created a variety of wares, often with distinct regional differences. 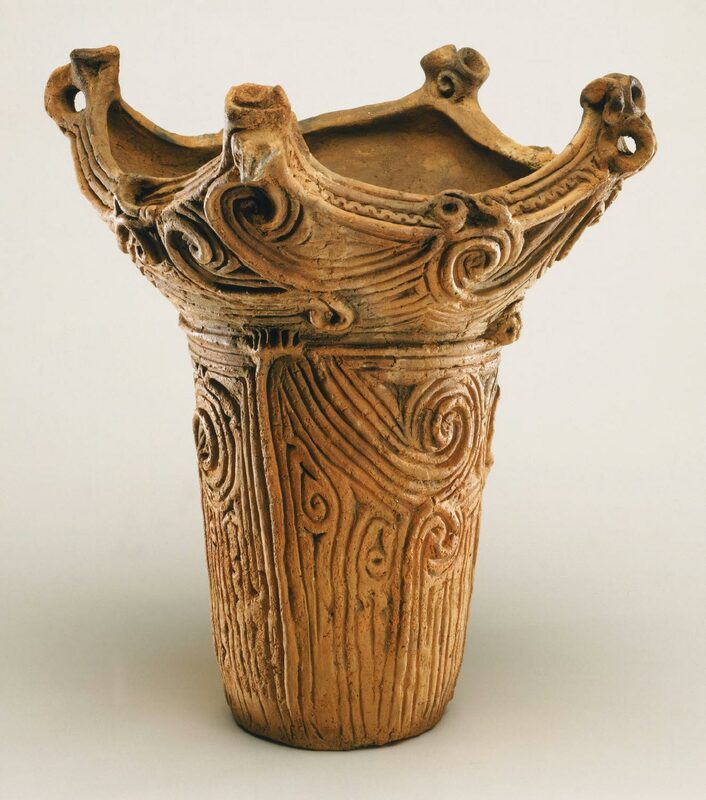 This magnificent jar exemplifies the style that predominated in the central area of Japan’s main island, Honshu, during the Middle Jōmon period (2500–1500 B.C.). Its type is called Katsusaka, after the archeological site in Kanagawa prefecture where pieces in this style were first unearthed. The term Jōmon (cord-marked) is taken from the decorative technique found on the pottery of the time. Potters applied clay, which was rolled into long cord shapes, to the surface of their hand-built wares as a form of embellishment. On this jar the artist worked the clay cords up from the base along the cylindrical body in vertical lines that are capped by swirling loops. Along the upper part of the body, the potter applied a wide horizontal band of the spiraling cords, which look like waves rolling around the circumference of the jar. The wave motif continues at the top of the vessel, where the potter finished the rim with a thick, incised triple band that swoops up into open curls at the four corners, two of which have small, open-looped handles. The cord appliqué technique gives the piece an exuberant and lively quality that emphasizes its sculptural features. This dynamic, three-dimensional form is a hallmark of the Middle Jōmon pieces found at the Katsusaka site, and the present piece is one of the finest extant examples of the style, making it an ideal addition to the Museum’s collection. Felice Fischer, from Philadelphia Museum of Art: Gifts in Honor of the 125th Anniversary (2002), p. 2.